Amazon has launched local delivery service Amazon Now that offers two-hour delivery for daily essential items in Bengaluru. The Amazon Now app is live on Google Play Store. Customers can use the app to buy household supplies, groceries, dairy products, cooking essentials, kitchen and home essentials, snack foods, baby care, beauty care and personal care products from Big Bazaar, Godrej’s Nature’s basket, Reliance Fresh, BPCL In & Out as well as the neighbourhood kirana stores. With this, Amazon.in will now compete with hyperlocal startups such as Grofers, Big Basket and PepperTap. 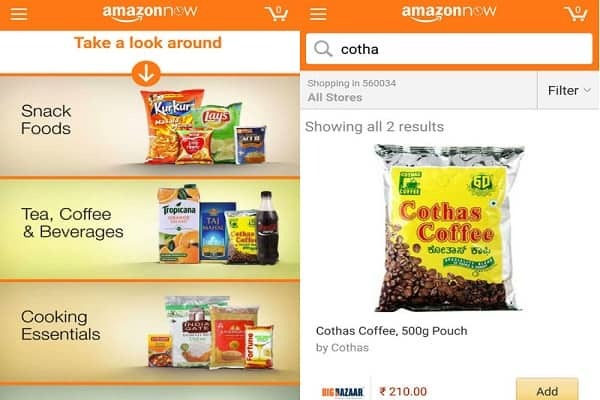 Amazon Now will also compete with Nearby, the app-only online grocery service launched by Flipkart in Bangalore in October. Flipkart already is the US Company’s biggest rival in the e-commerce marketplace segment. Amazon has come out with a video ad that highlights the fast delivery services provided by Amazon Now. Amazon App allows the user to sign in or even explore the products as a guest. You can look at the products either department wise or browse a particular store. The user can search also for a particular product. A great feature in the app is that if a product is available in multiple stores a comparison table is presented to the user so she can select the cheapest option. Users who want the essentials on the urgent basis can select the delivery option of Express Delivery. Amazon guarantees the delivery of goods within two hours upon selecting the express delivery option.